Create the base by cooking up some veggies. I used onion, broccoli, spinach, brussels sprouts, zucchini and cabbage. Add to a huge pot with a tiny bit of olive oil or some olive oil spray, cook until just sweating/tender. Take out the veggies and place a portion of veggies each into individual glass containers. 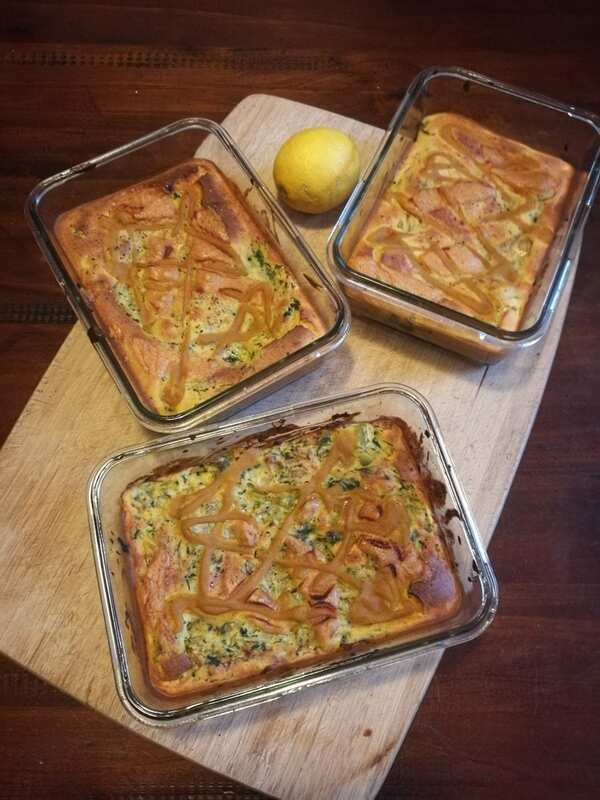 Preheat the oven to 170 degrees then whisk together 1.5 servings of lupin flour with 3 eggs (to make 3 serves protein) with the juice of 1 lemon, 1/2 zest of a lemon, 1/2 cup almond milk, salt & pepper, garlic, dijon mustard and a pinch of baking soda. Pour this batter over the top of your veggies. Grab 2 x servings of cheese and top each with 1/3 serving, then drizzle with extra mustard. Bake for 30m in the oven.